Is The National Enquirer An Extortion Racket? With the President As Its Biggest Catch? I previously discussed the National Enquirer’s collusion with the Trump Campaign to suppress adverse stories about him. However, I regard the implications of related breaking news as worth its own article. AP is reporting David Pecker (the aptly-named CEO of The National Enquirer’s parent company) stored Trump’s records, in a safe, with similar documents pertaining to numerous celebrity catch-and-kill deals. Pecker, AMI, and The National Enquirer used this secret cache of celebrity secrets to enhance their power and influence. Was the National Enquirer ultimately just an extortion racket? One that selected favored celebrities, (often influential politicians) to protect, while raking those who refused to play the game over the gossip coals? If so, the question becomes whether Donald Trump was their biggest catch ever. After all, having the President of the United States in one’s pocket is quite the valuable resource. If you think that sounds crazy, consider this: Trump once openly Tweeted about using the The National Enquirer to blackmail Mika Brzezinski and Joe Scarborough. I said all along that the true concern of the Karen McDougal and Stormy Daniels stories, with Trump’s payoffs to silence them, was not about the alleged affairs. It was how these two women so easily blackmailed the President of the United States. Was the National Enquirer in on that game too? Which gets to the point. This President is a security risk. If he were not President he could never qualify for a security clearance with his record. There’s a basic question. 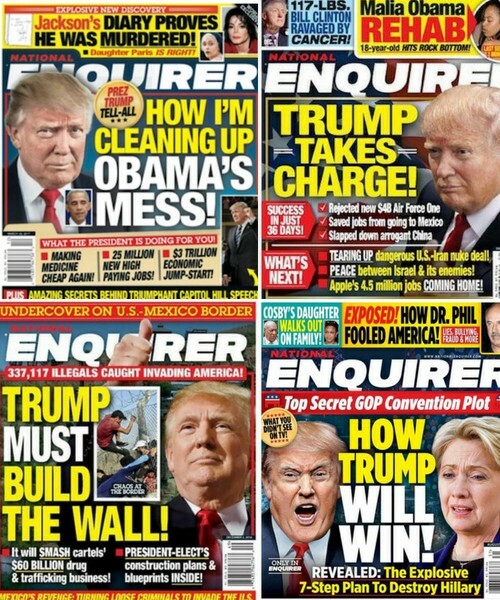 Why would a tabloid, built upon reporting scandal and gossip, provide such positive coverage, as reflected in these covers, of a man replete with scandal and gossip? Something else had to be going on here, and it was. The Enquirer was secretly buying the President of the United States. They had dirt on him that they withheld from the American people, so they could exploit that later. What additional price did Pecker have in mind for Trump — and America — to pay?